Boer War Collection - Boers - Detailed History of the Railways in the South African War 1899-1902. You are here: Books Boers Detailed History of the Railways in the South African War 1899-1902. Detailed History of the Railways in the South African War 1899-1902. 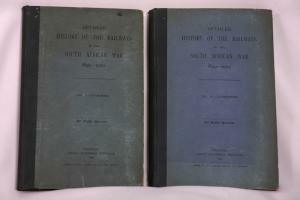 Description: Detailed History of the Railways in the South African War 1899-1902. Blue/green covered boards backed in green cloth. A record of railway operations during the war abridged from the four volume official record compiled by the War Office. The present work is drawn from the last three volumes of the original compilation and issued under the title - Detailed History of the Railways, Etc., in two volumes. Volume 1. Letterpress. xxvi + 275 + xxvii - xli. pp. With colour folding map as frontispiece. 1 other folding map, 2 foldingtables, 6 graphs, 6 plans. Volume 2. Illustrations. vii + 61 pp. title label on the back, Royal Engineers Institute, Chatham, 1904.
:- R.G Hackett, South African War Books p74.